When there is a world wide devastating event like Hurricane Katirna or the earthquake in Haiti that affects an extraordinary percent of the population, organizations will take out ads in the newspaper, in magazines, and run commercials on TV and radio which generate large amounts of relief aid to those affected. But sometimes it is a hassle trying to text in a donation and having it charged to your phone bill, or having it not go through at all, in which case you would have to go onto the website and fill out 2 pages worth of billing information. What about the other catastrophic events that happen almost daily around the world that we never hear about? 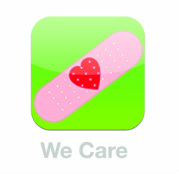 That’s where the We Care widget comes in. It is a widget designed for immediate access to disaster stricken areas that most need it, as provided by world relief organizations. We Care will connect to current field news, upcoming events, as well as podcasts and videos from organizations such as Oxfam, Red Cross, and USAID. If you want to support a relief effort and donate, the task is made simple with PayPal. You simply select the amount you would like to donate to that organization, enter your PayPal username and password and click send. This project was a proposal of a variation of the “network of learning centers” suggested in Victor Papneck’s Design for the Real World: Human Ecology and Social Changes. I explored the idea of a consortium of schools/design centers that are located in neighborhoods around the world that are focused on local design initiatives. The significance of design education has developed naturally from a growing awareness of the importance of design in the daily life of the culture, however, in order to efficiently benefit culture through design there needs to be a culture education as well. Sure it is possible to learn about the different cultures you’re designing for in a book, or nowadays on the internet or television, but you cannot truly know a culture until you have lived as they live and have walked many miles in their shoes. Schools that already focus on design such as Parsons, SCAD, Pratt, RISD have a curriculum that lends itself too much to opportunities abroad that consist of quick intensive design solutions for local communities and focus more on conceptual design. However, in my proposal for the globally local design network, design institutes like these will not become obsolete. The consortium I propose will also partner with these schools providing students with an opportunity to experience what it really means to live and design locally with communities. They will be exposed firsthand and may eventually choose later in their career to become apart of the network. The globally local design network that I am proposing will be just that, a network with locations in rural communities all around the world. It will be comprised of designers obliged to make a 2-3 year commitment per community. They will design anything the community may need from products and buildings, to spaces, systems and landscapes. They will strive to design not for, but with the local population being as environmentally and economically sustainable as possible by using primarily using local and native resources. The curriculum will empower designers and locals in the community to think and be united globally, while acting locally through an online platform where they will post anything from ideas and insights, to prototypes and final projects. They will give feedback to other fellow designers in similar programs around the world and will also be able to exchange locations with another designer after their 2-3 year commitment.